1. Visit Cave of Winds, explore Niagara Falls in Depth. 2. Exclusively visit the Mysterious State Park - Watkins Glen State Park. 3. Board on North America's tallest building - One World Trade Center. 4. Take Philadelphia open-top double-decker bus to learn about the birthplace of more than 30 East American historical cradles. 5. Inside of US Capitol. 6. Joining New York Night Tour to enjoy the charming night view of Times Square, Empire State Building, and Rockefeller Center. Chicago Night Tour:Starting from Crown Fountain at Millennium Park, we will set off to Michigan Avenue where you can view “the Magnificent Mile” for grasping a good general idea of the night life scene in downtown Chicago; and take a walk alongside of Chicago River. The last stop will be at the Michigan Lakeside with a panoramic view of the world-class city skyline of Chicago. A. O’Hare airport (ORD) free shuttle services: 9: 00AM - 9:00PM (flight arrival time). Tour guide arranges you and other members to take the nearest shuttle to leave the airport. Guests who enjoy free airport pick-up do not include a tip of $10 per person; tour guide will collect it the day before the tour ends. B. O’Hare/Midway Airport to hotel private shuttle service (24 hours): $120 for 1st and 2nd persons, $10 for each additional person. C. No flight: Please notice in advance and convergence with us at O’Hare airport; shuttle bus will take you to the hotel. You will see Chicago in one day, the world’s top architecture city with bold architectures. 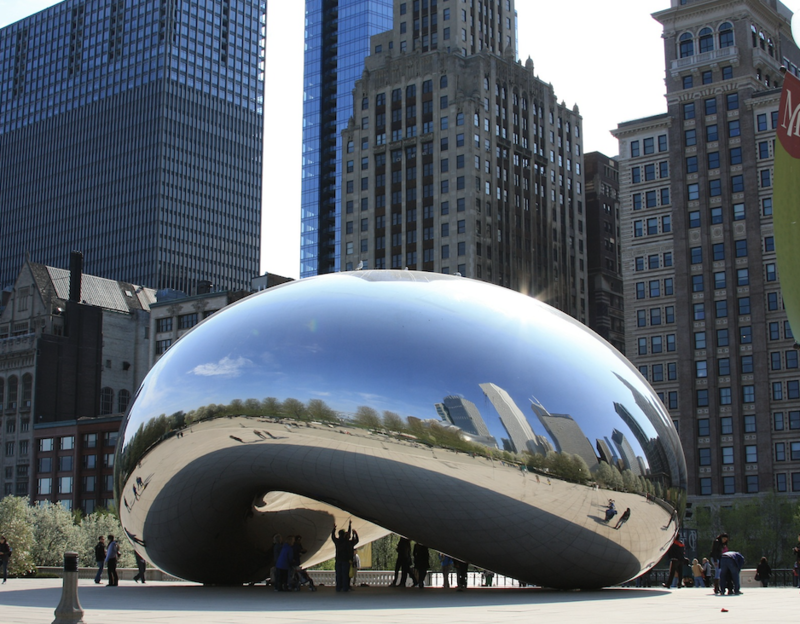 Take a walk in the Millennium Park to see Cloud Gate; Buckingham Fountain, Navy Pier, the corncob shaped Marina City, Trump Tower, Willis Tower and etc. 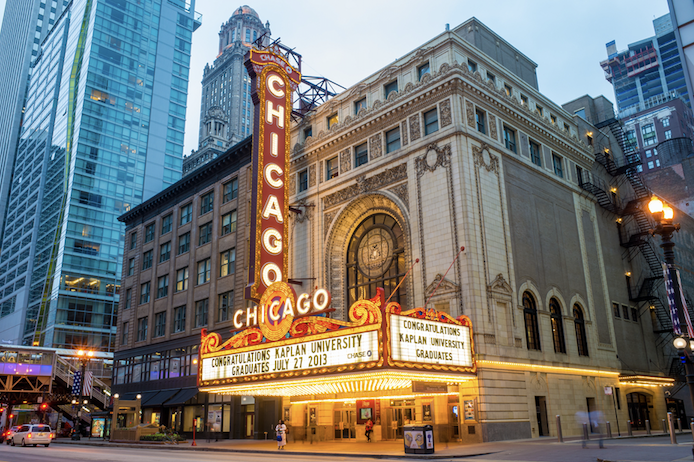 Take an exclusive tour of the Chicago Theatre. Stop by Michigan Avenue, the Magnificent Mile, where the Art Institute of Chicago, Grant Park, the historical Chicago Water Tower are located. You will go up to the 360 CHICAGO to have the best view of this famous city. Take our river cruise to view why Chicago is the birthplace of skyscrapers. Our tour will start with Detroit, the American automobile capital, where we will visit the Henry Ford Museum, named after the founder of the Ford motor company, an amazing complex comprised of 7 buildings and an extensive collection including John F. Kennedy's presidential limousine, Thomas Edison's laboratory, Abraham Lincoln's chair from Ford's Theatre, the Wright Brothers' bicycle shop and the bus that Rosa Parks sat in. In Niagara Falls, we learn the legend of Niagara Falls by watching the IMAX movie, ride Maid of Mist boat and view the falls up-close. Take in-depth tour and see Lake Ontario in a historical Old Fort. Go to Goat Island and visit Cave of the Winds. We will stay in hotel located in Rochester. Watkins Glen State Park is located in the village of Watkins Glen, south of Seneca Lake in Schuyler County in New York's Finger Lakes region. It is a layered rock geological, eroded by glaciers and streams, forming a peculiar landform. There are 19 waterfalls along the canyon trail about two miles away. There are excellent mountain climbing trails, waterfalls that can be seen from close quarters. (*Watkins Canyon State Park is a mandatory activity, $15/person.) And then, we will reach New York City, where we can visit The Metropolitan Museum of Art. A deep New York night tour ($25/person) will also be arranged in the evening. Rockefeller Center is a large complex consisting of 19 commercial buildings covering 22 acres between 48th and 51st Streets. In the center of the complex is a small sinking square, fluttering the 159 colorful flags of the United Nations in the sky. The Fifth Avenue gathered countless global luxury boutiques. Multi-colored advertisements, giant screens, neon staggered, and vibrant fashion men and women, all of these you will find out at Time Square, it highlights the city's prosperity and romance. Empire State Building, the must-see point in New York, as a symbol of the New York skyline, it has had a tradition of changing tower colors since 1976 to celebrate various anniversaries and events. The nearby is Korean Town, a variety of Korean cuisine, Korean cosmetics and accessories over there, especially known for authentic Korean cuisine. At Washington D.C., we will visit the Lincoln Memorial, Vietnam Veterans Memorial, and Korean War Memorial. Besides, we can take photos of the White House. In the Madame Tussauds Presidents Wax Museum, you can take pictures with Presidents Obama, Trump and other celebrities. Pass by the Jefferson Memorial, Washington Monument, and World War II Memorial etc. Next, we will have D.C. in-depth tour ($25/person): Including the Capitol Hill, Library of congress (Inside visit. ), and Supreme Court (Photo stop). (*D.C. in-depth tour is a mandatory activity, $25/person.) After it,take [Capital Cruise] to enjoy the view of the US’s mother river, the Potomac River. It is your only chance to appreciate the "Pentagon" of the US Department of Defense! Tour in D.C. ended here, we are heading to Pittsburgh and see State Point Park. Capitol Hill is the seat of the U.S. government, home to the domed United States Capitol, Senate, Houses of Representatives and the neoclassical Supreme Court. Members of Congress gather here to make laws. The President of the United States is also sworn here. Library of Congress is one of the five national libraries in the United States. It has 30 million books, covers 470 languages, and has more than 58 million manuscripts. Supreme Court of the United States is the highest level of federal court.The entire door is supported by 16 marble columns. On both sides of the stone steps in front of the main entrance of the West Hall, it is the statue of justice and the statue of the law. Today, we will travel to Cleveland, OH. Our tour of the city includes a stop at the Rock and Roll Hall of Fame. Each year, musical acts that have influenced the history of popular music are inducted into its eternal halls. Later, we will return to Chicago. Guests who back home by flight, please book flight fly out O’Hare airport-ORD after 19:00. (2) In case of attraction closures (due to holidays or construction, etc.) tour guide may adjust the itinerary accordingly if necessary. (3) This tour does not accept any City Pass or your own tickets for the attractions. Guests need to purchase admission tickets from tour guides. Baggage regulations:1 large or 2 small baggage for each person.